A charter plane has crashed into the Direct Factory Outlet shopping mall near Essendon airport in Melbourne, likely killing all five people aboard, police in the state of Victoria have announced. "There were five people on the airplane and it looks like nobody's survived the crash," Victoria state police assistant commissioner Stephen Leane said. Earlier, Victoria Prime Minister Daniel Andrews announced that “a number of people” died in the crash, calling it “the worst civil aviation accident that our state has seen for 30 years." The incident happened at around 9am local time Tuesday. It’s understood the flight took off at 8:30am from Essendon, which Reuters reports is a small airfield mainly used by light planes, and was bound for King Island. The shopping center was not due to open until 10am, according to local sources. The Air Operations Unit of the Melbourne Fire Brigade are preparing to deploy an aerial drone to help battle the blaze. 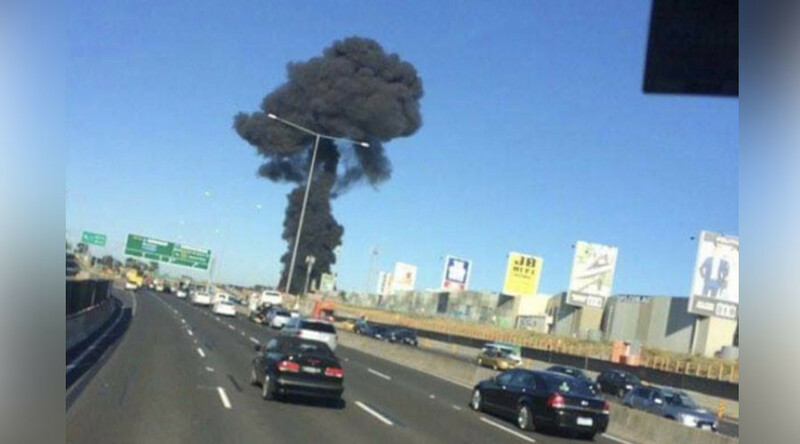 Debris from the crash has forced the closure of a number of lanes on the nearby Tullamarine Freeway and motorists are urged to avoid the area. Initial reports on social media speculated that the aircraft was an air ambulance but that has been denied by Ambulance Victoria in a tweet. Contrary to media reports the plane that has crashed at Essendon is not an Ambulance Victoria aircraft. Flights in and out of Melbourne’s main airport have not been affected, a spokeswoman for Airservices Australia told Reuters.